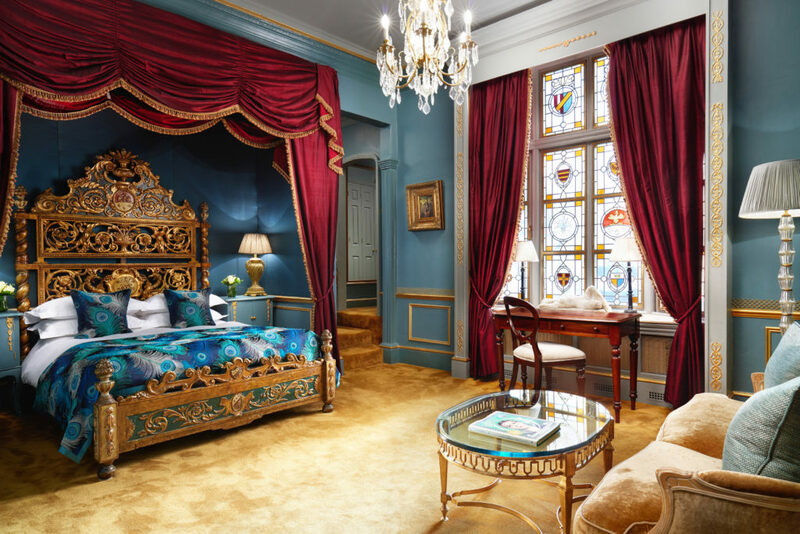 The Gore London – Starhotels Collezione in South Kensington London, is one of the closest hotels to Kensington Palace, and dating back to 1892, this elegant Victorian building has close connections to royalty. Although there isn’t any evidence that Queen Victoria or Albert stayed at the hotel themselves the proximity to the Royal Albert Hall enhances a very regal feeling. Even if the ‘real’ Royals didn’t frequent the hotel, guests who were (and still are) certainly in the ‘Royalty’ league of the entertainment and arts industries favoured The Gore. British Rock band, The Rolling Stones, hosted the launch party of album The Beggars Banquet back in 1968 (almost 50 years ago to the date!) 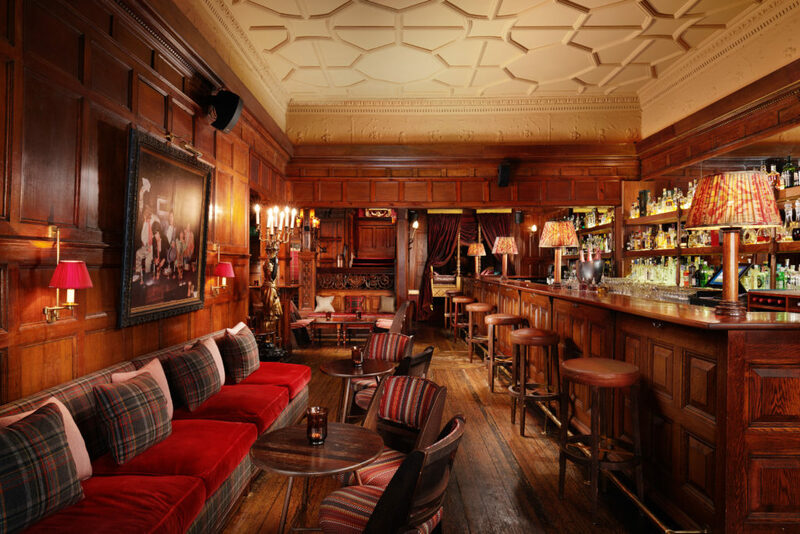 in the hotel’s charming bar 190 – with original photographs displayed throughout to prove that the band always loved a party! Judy Garland, one of the most-loved movie and musical stars of Hollywood’s Golden Era, was a regular guest here and even donated her bed to the Junior suite named in her honour. Miss Ada and Miss Fanny are other suite name sakes and they are two sisters who were the original owners of the hotel and were descendents of the great British Explorer Captain James Cook – there is so much history behind this building, which used to be two mansion houses Nos. 189 and 190 Queens Gate, it’s worth reading about it even if you don’t stay at the hotel. So, with this right-royal-feel it seemed only fitting that TLE stayed here whilst attending the Royal Gala Dinner for Tourism Thailand in London a couple of weeks ago (….and yes, a real Princess graced our presence at this exciting event hosted at The Dorchester). 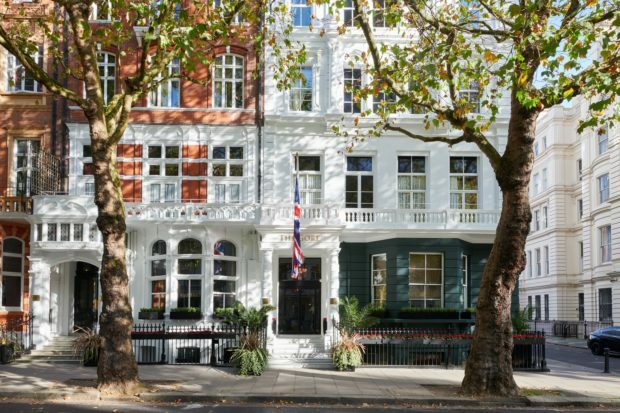 The Gore is located in one of London’s most prestigious neighbourhoods and the hotel’s stature of a Victorian terrace town-house in most impressive. The famous Bar 190 is at the front left of the entrance hall, just before you arrive at the reception desk and the restaurant 190 Queen’s Gate by Daniel Galmiche to the right – again just before approaching the reception desk, easily accessible given that both the bar and the restaurant are frequented by many non-hotel residents after both, respectively, building a credible reputation for a great atmosphere and drinks and of course exquisite food. 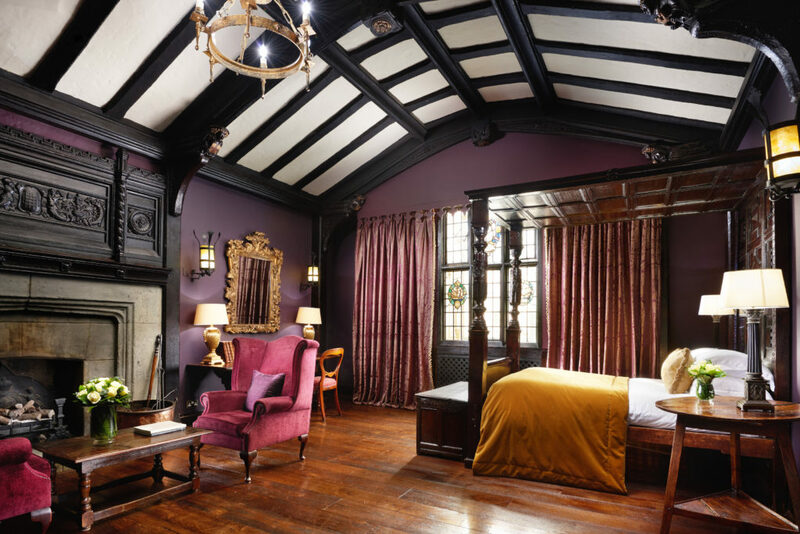 The rooms range from single rooms through to the very impressive Tudor Suite. Each of the 50 rooms are individually furnished with beautiful antiques, period photos and soft furnishing and ornately decorated beds. The rooms are spaced across three floors and are a variety of shapes and sizes – all of this combined means that each room has a very distinct character. I was lucky enough to be given a tour of the hotel and viewed a few different rooms and I was amazed by how different each were – although all equally as charming. 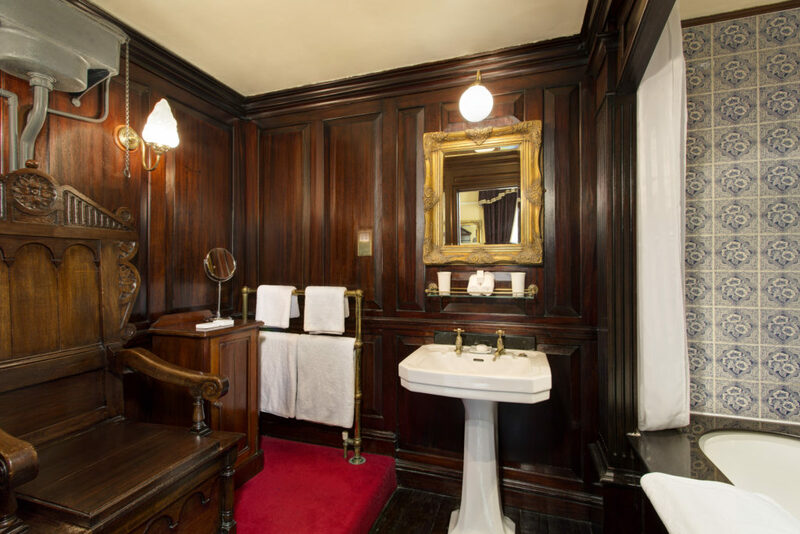 Many of the rooms still have original Victorian features such as the ‘Throne Lavatory” (see pic below). 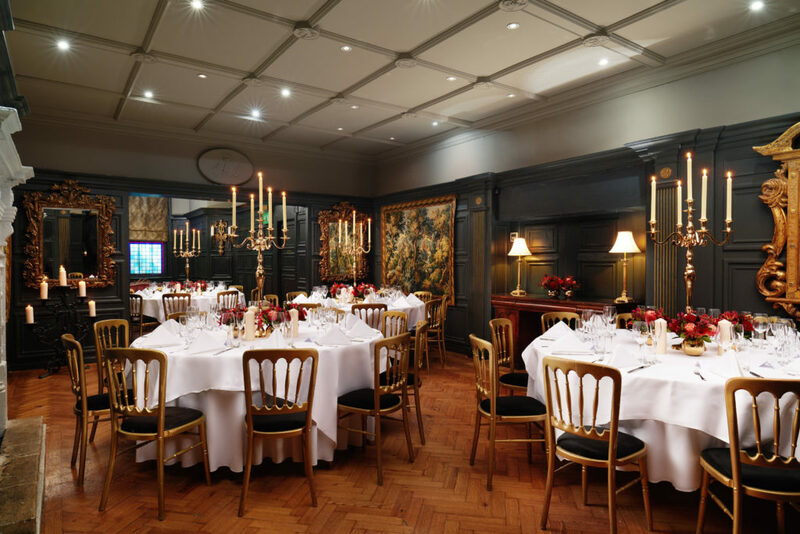 The crowning glory has to be The Tudor Suite, which is also known as the honeymoon suite as the hotel hosts many weddings because The Tapestry Room (located on the lower ground floor) is a great space for such occasions and other types of private parties. WOW! I was really taken aback when we entered; the mahogany four-poster bed, wooden floors, high oak beamed ceilings, stunning stone fire-place, candelabras, rich period decor and original wooden gallery looked like a film set. Oh, and I must not forget the original stained glass windows and the library of books – most of which are original publications. This suite has a private entrance too should guest wish for anonymity. It really was impressive and I can’t imagine there are many places in London that can lay claim to such a historic and beautifully romantic factor suite. My suite was “Dame Nellie” named in honour of the Australian operatic soprano who was one of the most famous singers of the late Victorian era and a regular guest at the hotel following performances at the Royal Albert Hall. It was extremely spacious with a king-size ‘Starbed’ strategically placed in a recess within the room. An ornate chaise longue, desk, dressing table and other decorative period furniture adorned the large room and housed the modern facilities such as the TV, mini-bar, coffee and kettle. There was a small dressing / wardrobe area between the bedroom area and the bathroom which was fabulous; a large marble set bath with a huge rain-head shower took centre stage and two almost life-size bronze ‘David’ statues standing on each side. British perfume house Penhaligon’s was the bathroom amenities brand of choice, which is no surprise given that the founder, William Henry Penhaligon’s, became Court Barber and Perfumer to Queen Victoria. I do get spooked easily and when I first entered this suite I thought I may not sleep well but it didn’t have a spooky feeling at all and I slept very, very well. No disturbances from inside or outside the room or hotel. My visit was a very short one so I didn’t have time to dine in the restaurant or drink in the bar. However, I am reliably informed that the quality of the food is excellent and although the fine dining restaurant itself is not Michelin star, Michelin-starred chef Daniel Galmiche oversees the running of the menu and the team who serve up delicious great British classics with a contemporary touch and exquisite French flair and is a very popular choice for pre-and post dinner with guests of the Royal Albert Hall, given its convenient location. 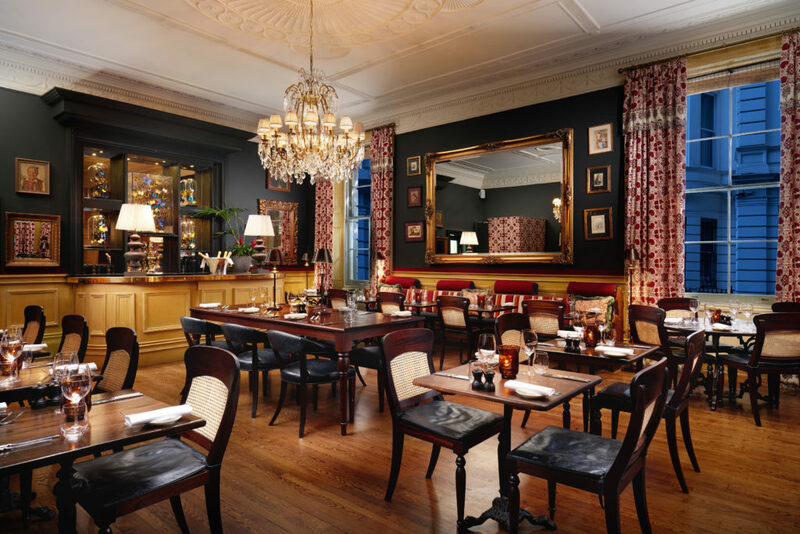 The restaurant is open only for Afternoon Tea or dinner (including pre-theatre). Breakfast wasn’t included in my room rate and I had an early train to catch so cannot comment on their breakfast offering. If you’d like to enjoy an insight into British history in a truly British style then be sure to ask the concierge at the hotel about the different classic car tours on offer. Choose from a 1970 ex Crown Daimler Limousine or a vintage open top 1920’s Roll-Royce both of which are chauffeur driven and will take guests on a luxury tour of the sights and sounds of London’s best bits. Alternatively, guest can choose to personalise their own tour. For more details on their Classic Car experience. The hotel did look a bit tired in places but it is undergoing a refurbishment due to be completed in 2020. However, the odd show of wear and tear did not detract from the overall charm and historic grandeur that this hotel boasts. Starhotels is a Florence-based, family-owned hotel group, which epitomises high-end Italian hospitality. The Group has 29 hotels in the most beautiful destinations in Italy, Europe and US. The Gore is part of the Starhotels Collezione which is a collection of the brand’s most representative hotels, 12 locally inspired iconic properties with a strong heritage and personality. All Starhotels properties are strategically located in the heart of the most beautiful cities. Considering how much history and what a great location this hotel is very good value in comparison to its nearby peers. It is elegant, charming and almost eccentric in a very British way and I really enjoyed my short but sweet stay here. However, I enjoyed it much more once I understood more about this boutique hotel so I do urge guest to read about it and explore as much of the hotel as you can to really get to know it. I wish walls could talk as I am sure there are many great Gore stories to tell!! Rates are subject to availability and always best to book direct. Curious in nature and a stickler for detail makes me a discerning traveller with high standards and high hopes.